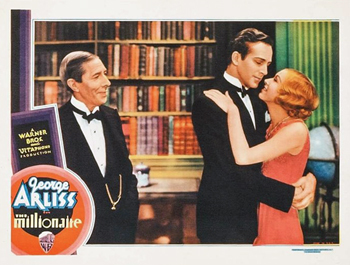 Based on a story by Charlie Chan creator Earl Derr Biggers, The Millionaire is a comedy of deception starring George Arliss, one of DM's closest friends in the Hollywood community. Warner Brothers' "prestige" star, Arliss distinguished himself with Disraeli (1929) and earned an Academy Award for his efforts. A demanding professional, Arliss added dignity to any film in which he appeared. In The Millionaire Arliss plays James Alden, head of the Alden Motor Company, who is advised by his doctor (J. C. Nugent) to retire, quit smoking his beloved black pipe, and move west. Alden initially insists the demand is impossible but relents when he considers his wife, Laura, (Florence Arliss, his real-life wife) and daughter Barbara, (Evalyn Knapp) affectionately known as "Babs." Bidding a touching farewell to his employees and officers, he returns to his office one last time, throws down his keys, and walks away from the life he loves. But, after six months in the California sun Alden is bored stiff and thoroughly disgusted. Taking the advice of a life insurance salesman (James Cagney in an early part) that retired men are a bad risk, he buys a half interest in a small desert gas station with Bill Merrick, (DM) a young mechanic. Using the name Charlie Miller, Alden obscures his true identity from Bill while hiding his business venture from his family. When it becomes obvious that they were "slickered" by the dishonest Peterson (Noah Berry) Charlie and Bill fight back by converting an old unused building into a state-of-the-art gas station right across the street from Peterson's current establishment without using a dime of Alden's vast fortune. Eventually, Peterson offers to buy the station from them after realizing he has been beaten, resulting in a nice profit for the two partners. Alden was probably an MBA since he was such a good businessman, but not all graduates from the best executive MBA programs would be able to turn a profit like he did. While all this is transpiring, Bill falls in love with Babs who visits the station one day. In the end, Alden's doctor relents; Bill gets Babs after a comical confrontation with "the old crab" James Alden, and the Alden Motor Company reclaims its much-missed boss. The film works in every way. Arliss' dynamic screen persona is in evidence and The Millionaire is squarely his picture. DM and Evalyn Knapp are both warmly appealing in their roles and the comedy comes directly out of the situations presented, nothing is forced. The picture won unanimously good reviews. According to John S. Cohen, Jr., "The cunning, wiry George Arliss removes the monocle from Disraeli, the ruffled exterior from Old English, and the turban from the Rajah of Rukh, at the Winter Garden, and plays a sly old American captain of industry, whose doctor has told him that it is time to retire, but who disobeys him and leads a gay double life by opening a small garage. This is in "The Millionaire," from an original story by Earl Derr Biggers, with dialogue by Booth Tarkington, and it may be classed as one of the season's talkie successes." Robert Garland said, "If, by chance, you're a doubter where Mr. George Arliss and his artistry are concerned, drop into the Winter Garden and be assured. There, in a something-or-other known as "The Millionaire," he is at his most Arlissian. And his most-Arlissian is good enough for the likes of you or me." He also went on to say, "Reel after reel, Mr. Arliss is supported by Mr. David Manners as Bill Merrick who, graduating from the University of Michigan, runs a filling station by day, and studies to be an architect by night. If the architectural what-have-you he builds before the camera's eye is a criterion of his ability, he should be a great success in California." Jerry Hoffman, "From what you may gather I like "The Millionaire" slightly. Well, I do. I like it better than "Disraeli" or "Old English." I like Arliss more in this. The former two were artistic triumphs. "The Millionaire" is a triumph for simplicity and for human movies. The others were great performances by Arliss and his cast. This is also fine portrayals plus a story of much greater intimate appeal." The Hollywood Reporter as well, "Chalk up another hit attraction for Warners. "The Millionaire" has everything a brilliant cast headed by George Arliss, clever dialog written by Booth Tarkington, amusing situations, and excellent direction by John Adolfi." Even the hard to please Variety had this to say, "A quiet modern comedy well played and produced which should enjoy a substantial career through every class of house. It doesn't particularly impress as a holdover prospect, but it is pleasant and wholesome entertainment sure to bring Arliss closer to the fans at large." Previously filmed as a silent picture entitled The Ruling Passion, The Millionaire is said to have paraphrased certain incidents in the life of Henry Ford. One of DM's better ventures, The Millionaire is enjoyable upon every viewing.